Stylish, sporty and, of course, loaded with the latest safety features. 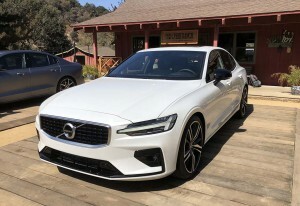 The 2019 Volvo S60 R-Design features a 400-hp plug-in hybrid drivetrain. It wasn’t all that long ago that we began to wonder if the Swedish auto industry was headed for Valhalla. After all, the long-troubled Saab brand collapsed during the global economic downturn at the beginning of the decade, despite several rescue attempts. And, after struggling to turn things around at Volvo, Ford decided to sell that brand off to the Chinese. What seemed like a questionable move turned into salvation as Volvo’s new owner, Zhejiang Geely, decided to pump billions of dollars into the development of an all-new product design and a radical shift in direction on the powertrain front. With Geely’s support, in fact, few brands have done more to transform their image than Volvo. 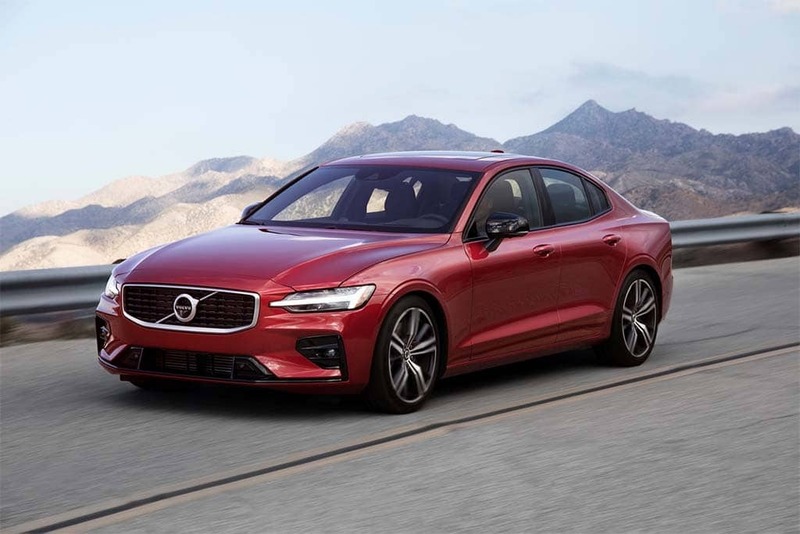 Long known for safe but boring wagons and sedans, the Swedish automaker now offers one of the freshest and sexiest line-ups in the near and mid-luxury market, and the all-new 2019 Volvo S60 is the latest, welcome addition to the model mix. Those who think sedans are passé are going to be in for a surprise. Like the bigger S90, the compact S60 adopts a sleek, coupe-like look that doesn’t compromise interior space. And it delivers the sort of handling and performance – especially with the new Polestar package – that you traditionally wouldn’t associate with a Volvo. Of course, there are also plenty of the advanced safety features you’d expect from the Swedish brand, as well as the latest version of its Sensus infotainment system, here with added processing speed to address earlier complaints about the touchscreen package. We’d already driven the wagon version of the new 60-Series line-up during a late spring visit to Spain. To get a feel for the sedan we stayed a little closer to home, heading out to sunny Santa Monica, California, for a long day’s journey up the coast, with a dog-leg turn into the state’s mountainous interior. With a mix of back-country roads, open highways and L.A.-area traffic, it gave us a good sense of what the S60 would be like under just about any condition but a Swedish snowstorm. The new Volvo S60 comes in four trim levels, each increasing the amount of horsepower from the new sedan. As we began the morning outside Shutters, Santa Monica’s tony beachfront hotel, we were intrigued by the reaction of several passersby. The Volvo brand is small enough – without the big marketing budget of key competitors like BMW and Mercedes-Benz – that many folks still are caught unawares when they spot one of its new offerings. The S60 drew admiring stares and quite a few compliments while parked, and more than a few thumbs up as we headed out on the long day’s driver. The seventh new model in the brand line-up, the 2019 Volvo S60 is shorter and slightly narrower than the earlier S90 sedan, though both share the same, highly flexible Scalable Platform Architecture, or SPA. That puts it into the same category as products like the Audi A4, BMW 3-Series, Mercedes-Benz C-Class and Lexus IS. Compared to the outgoing version of the sedan, the 2019 S60 grows 4.9 inches in length, at 187.4 inches. The wheelbase has been stretched 3.8 inches, to 113.1 inches. The sedan sits nearly 2 inches lower, however, at 56.6 inches. The S60 isn’t a downsized clone of the bigger S90, though there are classic Volvo design cues, including the the familiar Volvo grille framing the brand’s iconic “iron mark” logo. The grille is framed by the now-requisite “Hammer of Thor” headlamps, with their distinctive LED running lights. The Volvo S60 Polestar Engineered puts out 415 hp — and you won't be getting one. Only 20 are coming to American and they're all spoken for. The long and gently sloping hood, complemented by flared rear haunches, gives the sedan a well-planted and muscular appearance, the car’s silhouette enhanced by deeply sculpted doors and a steeply raked windshield. A side-by-side comparison reveals the new S60 to feature a more balanced and aggressive shape than the old sedan. One particular nicety is the fact that Volvo’s absolutely massive panoramic roof is standard on all versions of the S60, a feature offered only as an option – if available at all – by segment competitors. Inside, the S60 retains Volvo’s traditionally Swedish minimalist approach to design. It has a furniture-like feel with an elegant but understated use of leather and wood, as well chrome accents. The new S60 is also offered with the distinctive new City Weave fabric option for those who want something other than leather. There’s also the new Polestar edition of the S60 which adds its own distinctive touch: gold seatbelts, as well as 19-inch, low-profile wheels and tires. 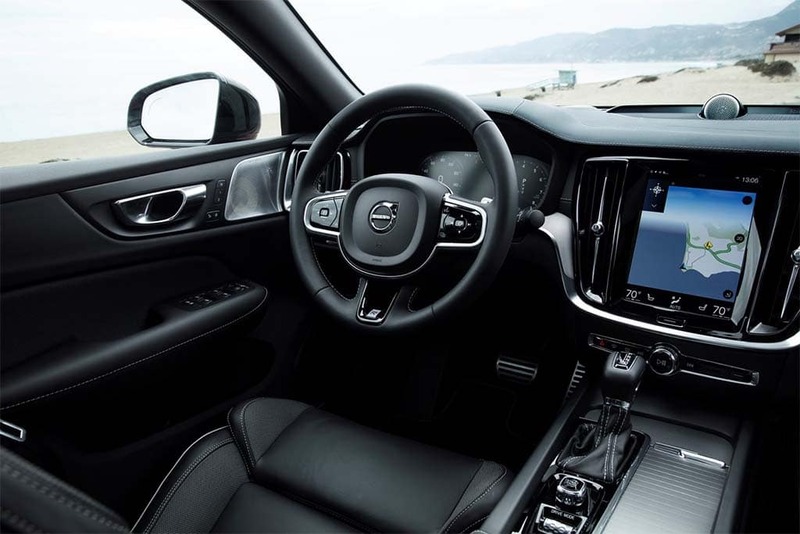 The most distinctive cabin feature is, of course, the big Sensus system which positions its 9-inch touchscreen vertically, rather than in the widescreen format most automakers adopt. However, the S60 R Design and its 400 horsepower will be available and that's still plenty of push. The approach has several advantages, among other things giving a driver more of a view of the road ahead if the navigation system is set to use the full screen. Otherwise, it is divided up into four distinct “tiles,” each handling a different function, such as audio and navi. The bottom tile, meanwhile, is customizable and can operate Apple CarPlay or Android Auto without losing the Sensus system’s built-in functions. Sensus has generated mixed reaction since first introduced on the latest-generation Volvo XC90 crossover. 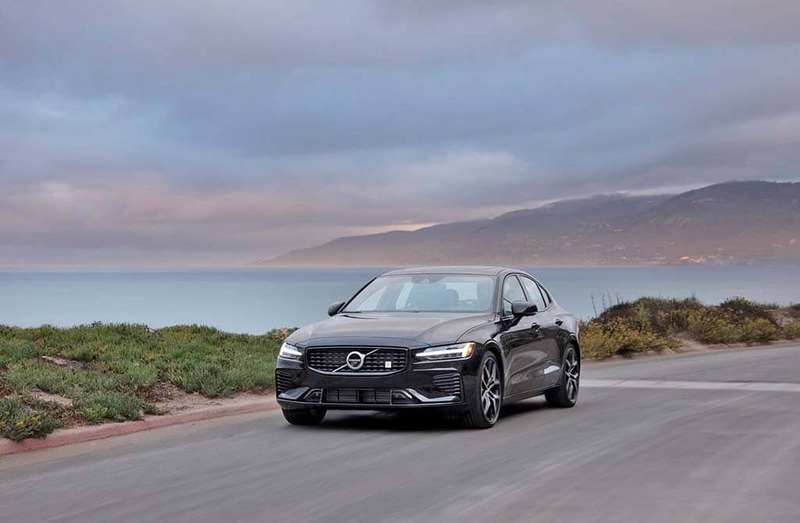 It still takes a bit of a learning curve to operate all the features built-in but, with the 2019 S60, the carmaker has addressed one of the most serious complaints, the lag-time between input and operation. Now, when you hit a virtual button or use smartphone pinch and zoom motions, it responds all but immediately thanks to its stepped-up processing power. Along with Sensus, the S60 integrates a wide range of advanced, digital-based safety technologies. These include the City Safety collision avoidance system that not only detects and reacts to other vehicles, but also pedestrians, bicyclists and even large animals. There’s rear cross-traffic alert, blind-spot monitoring and several unique-to-Volvo systems, such as one that helps the driver avoid a crash if they try to make a pass and discover oncoming traffic. Pilot Assistant is a semi-autonomous system that, while it doesn’t allow extensive hands-free operation eases demands in mundane driving conditions. The interior of the new S60 features the brand's "Sensus screen." Where the new 2019 Volvo S60 is likely to deliver the biggest surprise, however, is when you’re on the road and looking to have a bit of fun. The automaker kicked off plenty of controversy when, early in the decade, it announced plans to switch to an “all-four” strategy, meaning it would use only four-cylinder powertrains. It recently upped the ante by laying out plans to only use electrified drivetrains going forward on new models launched during the 2019 calendar-year and beyond. The S60, thus, will be one of the last all-new Volvos to be offered with a conventional, gas-powered drivetrain option. 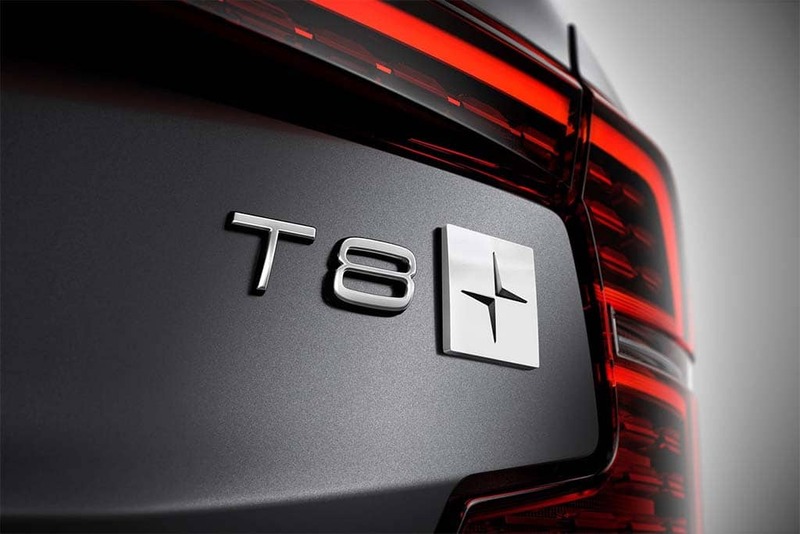 The T8 Polestar Engineered version of the T8 which punches the T8 up to 415 hp and 494 pound-feet of torque. During the course of our day-long journey we had the chance to drive both the S60 R-Design, the sportiest version with the standard T8 engine, as well as the Polestar edition. Not surprisingly, we were seriously impressed by the power the latter delivered. The Polestar Engineered badge is a sign of serious power ... that you're not likely to experience here in America. For those unfamiliar with Polestar, it started out as an independent tuner company campaigning Volvos on the motor sports circuit. The Swedish maker purchased the company a few years back, specifically to come up with high-performance niche models, much like BMW M and Mercedes-AMG. It is also being turned into a unique brand-within-a-brand delivering high-performance electrified products, such as the plug-in Polestar One and the soon-to-debut, all-electric Polestar Two. The S60 Polestar Engineered is an impressive package, not only offering serious power that only a few competitors can match, but also the sort of taught steering and crisp handling that makes it a real sleeper among performance editions. That said, we – and virtually every media colleague we spoke to after the drive – have one big complaint. Like all hybrids and PHEVs, the Polestar system (and the T8) uses blended braking. In this case, there’s a system that recaptures energy normally lost as friction and heat, transforming it into electricity to recharge the car’s lithium-ion battery pack. There’s also a set of gold-painted Brembo brakes that take over under especially aggressive maneuvers, once the generator/brakes reach their limit. On the Polestar edition, in particular Volvo needs to do some work, as the brakes are inconsistent and difficult to be sure just how much pressure to apply. That’s a big drawback when cornering or stopping hard. We found the regular T8 in the R-Design a little less unpredictable, something that suggests Volvo will be able to address the problem with some software troubleshooting. All that said, we were mightily impressed by the overall performance and handling of the new S60 and, as we experienced, the sedan will take other luxury buyers by surprise during a hard launch off a light. With a base price of $35,800, including $995 in delivery fees, potential buyers should find the 2019 Volvo S60 reasonably easy on the wallet compared to many import competitors. The R-Design pushes that up to $41,900, with the luxurious S60 Inscription package starting at $42,900. As for the S60 Polestar Engineered, you can’t have one. Really. Volvo plans to supply only 20 to the U.S. market for the 2019 model-year, and all have been spoken for already. All, meanwhile, were offered through the new Care by Volvo subscription program. Care customers can keep their vehicles for up to two years at a flat, non-negotiable rate that includes everything but gasoline. The Momentum model starts at $775 a month, depending upon options, the R-Design at $850. That even covers taxes, fees and insurance through Liberty Mutual. After a year, by the way, a customer can upgrade to a newer model within the same class, such as the V60 wagon or XC60 crossover. The program has been a huge hit, Volvo claiming to have hit its target numbers for the year within just four months. By offering a mix of conventional buying and leasing, as well as the Care program, Volvo sales have been surging at a time when the overall U.S. new car market is in the doldrums. 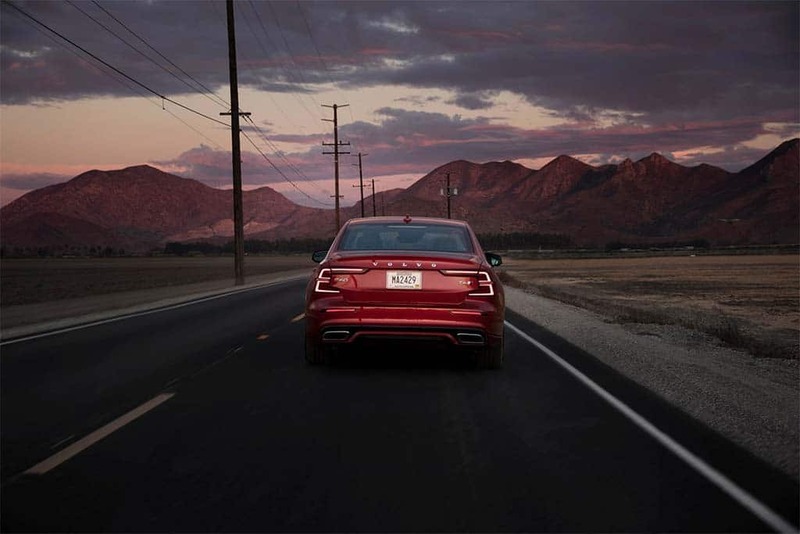 We’re confident the new 2019 Volvo S60 will only build the brand’s momentum. This entry was posted on Monday, October 15th, 2018 at and is filed under Automakers, Automobiles, First Drive, Luxury Vehicles, Reviews, Sales, Sedans, Trends, Volvo. You can follow any responses to this entry through the RSS 2.0 feed. Both comments and pings are currently closed.